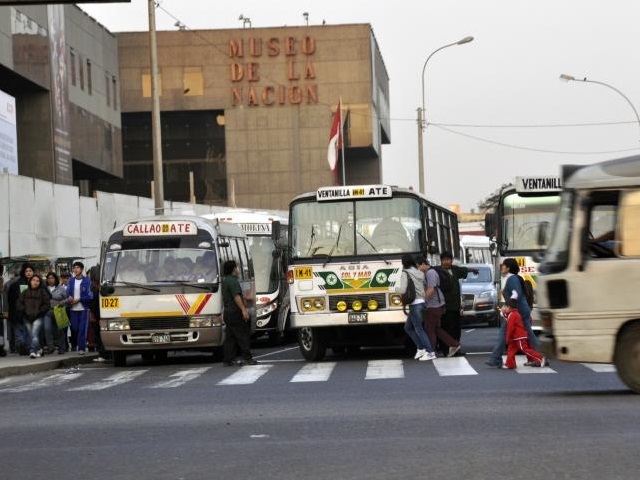 Peru’s PlanCC puts transport on the climate action agenda ahead of international climate talks. Photo by carlosfpardo/Flickr. The transport sector currently accounts for 22% of global greenhouse gas (GHG) emissions and emissions from energy consumption and is the fastest growing sector in terms of overall emissions. It is also responsible for 35% of per capita CO2 emissions in Latin America and is the leading sector in terms of emissions, much of which is driven by the growth in private car ownership. If governments in Latin America and the Caribbean (LAC) do not initiate policies to curb private motorization rates, fossil fuel needs could triple by 2050. Peru is leading the way by developing a national climate change plan, the Planificación ante el Cambio Climático (Planning for Climate Change or PlanCC) that includes a robust and comprehensive approach to reduce emissions from the transport sector. PlanCC comes at a precipitous time, as Peru is set to host the United Nations Framework Convention on Climate Change (UNFCCC) Conference of the Parties (COP 20) in December 2014. COP 20 is a crucial forum for countries to take meaningful action on climate change and set the tone for developing a new international climate agenda at COP 21 in Paris in 2015. Peru is taking the lead in building a coalition of LAC countries, including the Association of Independent Latin American and Caribbean states (AILAC) group, to advance climate change mitigation in the region. Peru’s PlanCC is part of the Mitigation Action Plans and Scenarios (MAPS) program, a collaborative project between South Africa, Peru, Chile, Brazil, Argentina, and Colombia. MAPS combines research and stakeholder interest with climate policy and planning to help developing countries in their path towards climate resiliency. Implementing PlanCC will require collaboration among many stakeholders both within and outside of government. Within government, Peru’s Ministries of Environment, Transport, Energy, Urban Development, and Finance are working together to create a cross-sector plan for transport that will position Peru for a long-term, low-carbon economic growth strategy. Manuel Pulgar-Vidal, Peru’s Minister of Environment, stated that PlanCC will be the basis for determining Peru’s contribution to UNFCCC negotiations. The creation of a national level climate change strategy will also require collaboration with the regional and local entities responsible for enacting PlanCC. Multiple national level institutions, including the aforementioned Ministries, are collaborating with regional and local government decision-makers to ensure that the PlanCC takes a comprehensive approach towards tackling climate change through the transport sector at all scales. Additionally, leaders in the private sector are being consulted in order to add depth to the perspective already provided by government institutions. As PlanCC takes a cross-sector approach, it is vital that the transport sector is included in this plan, and that solutions presented address the full range of climate-related challenges. Included within the transport sector are two key agenda items: reducing GHG emissions and recognizing the social and economic benefits of sustainable development. Reducing CO2emissions and energy consumption protects the environment and combats climate change. A vital component in reducing GHG emissions is the ability to track progress of emissions reduction in a measurable, reportable, and verifiable manner. PlanCC includes the development of a standardized, official data management system that collects, manages, and shares GHG emissions reductions data and will in turn bolster the relevance of transport in larger climate change discussions. Sustainable transport also benefits quality of life. For example, Mexico City’s Metrobús bus rapid transit (BRT) has reduced travel time by 50%, reduced traffic crashes by 30%, and has resulted in the reduction of 80,000 tons of CO2 emissions annually. Sustainable transport measures like BRT create jobs and opportunities, help cities save on healthcare costs, and encourage increased infrastructure investment. Peru is following the lead of fellow Latin American countries that successfully developed national climate change plans. Sixteen of Latin America’s 20 countries are developing national adaptation strategies, agencies, or plans to combat climate change. Mexico passed a national climate change law (Ley General de Cambio Climático) in 2012 and released its National Climate Change Strategy in 2013. Colombia announced its Low Carbon Development Strategy in 2011 and itsNational Adaptation Plan for Climate Change in 2012. A climate change plan at the national level is key to providing the technical basis to design and promote a legal framework that mainstreams climate change and sustainable transport in national policies and budget assessments. Peru and other MAPS countries are setting the precedent for other developing nations to strive for deep collaboration across sectors in developing national climate change plans. As the 2015 climate change agreements at COP 21 draw closer, transport lies at the nexus of several of these sectors, and in this role can pull together disparate dialogues into one unified course for combating climate change. If climate change is to be holistically addressed, mobilizing transport mitigation actions must be central to any and all climate change mitigation plans. For more information on integrating low-carbon, sustainable transport into global policy discussions on sustainable development and climate change, learn more about the Partnership on Sustainable Low Carbon Transport’s (SLoCaT) “Transport Delivers” campaign. Read more about EMBARQ’s effort with Peru’s PlanCC and transport’s role at COP 19.